There are so many different needle sizes available that it is sometimes confusing as to which one to use. This is a simple guideline chart to help ease the confusion. This is in no way meant to be used in place of a trained veterinary professional. 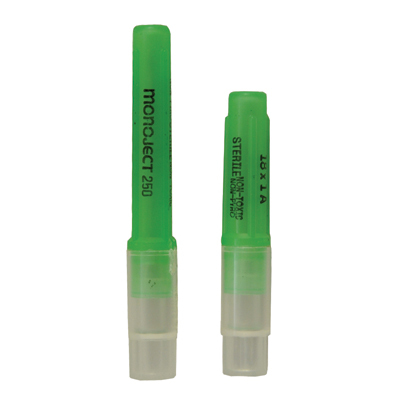 Monoject Luer Lock Syringe/Needle Combos are syringes with ultra sharp needles. 3 mL w/ 25 ga x 1"
3 mL w/ 20 ga x 3/4"
3 mL w/ 20 ga x 1 1/2"
12 mL w/ 20 ga x 1 1/2"
12 mL w/ 18 ga x 1"
I worked my cattle today 5/13/2014 used my Luer Lock Syringes. I ordered 2 boxes syringes and two 100 boxes of 18 gauge needles. I was very disappointed with needles where it was hard to withdraw medicine that had to be cold. The needles was entirely two long.Now I am stuck with something that does not work that great when your there working in the hot sun . I make sure next time bigger gauge needle and shorter needles. The Luer Lock syringes are the only way to go when giving medications. The locking tip keeps the needle firmly attached even with the rowdiest of animals. The use once and throw away needle and syringe combination is not only affordable, but convenient as well!